This year saw the Birr & District Motor Club run its annual Car Rally in Co Laois. The Rally which was held on the 27th February was based in the splendid surroundings of the Abbeyleix Manor Hotel. The Route took in Stages in the Rathdowney & Ballacolla Areas with Servicing taking place in the Retail Outlet in Rathdowney. A special word of gratitude is expressed from the Clerk of the Course Bill Ryan to all the residents along the rally route for their assistance & patience. Oliver Stanley had the services of ‘professional Co Driver’ Jenny Kent who completed the rally for the Alzheimers Society of Ireland. Jenny did a superb job in the Hot Seat. 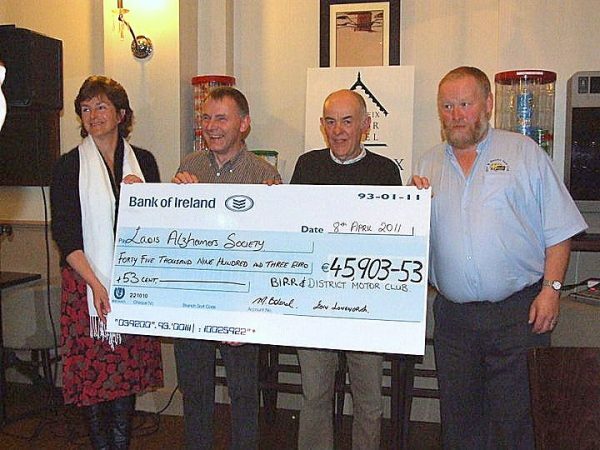 In conjunction with the rally a major fund raising programme was also initiated in aid of the Alzheimer’s Society. This raised in excess of €45,000 through Sponsored Shaves,waxing, Collections, Auctions, Table Quiz & Cookery Ware demonstration. The money raised at this event will go towards providing dementia specific home care . Out of the €45,000 raised it will provide an extra 50 hours of home care to 10 families on the waiting list in . We also will be taking family carers on weekend breaks away. These weekend breaks are the only opportunity for families to take a break away from their caring role. There are over 45,000 people in Ireland diagnosed with Dementia in Ireland and this number will grow to over 70,000 by 2026. The Birr & District Motor Club would like to thank all those who contributed to this special fund raising project & those who sold sponsorship cards. In addition a special word of thanks must go to the organising committee that consisted of Bill Ryan, Pat Horan, Oliver Stanley, Jenny Kent along with two very special friends who helped us out along the way RTE Sports Presenter Michael Lyster & 5 time Irish Tarmac Rally Championship Winner Eugene Donnelly.